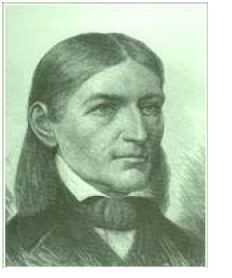 Friedrich Froebel (1782–1852) developed a series of educational principles and practices centred around the idea that young children learn by playing. In his native Germany, he developed an activity based approach to teaching young children involving playing with objects, singing, dancing and gardening which in 1840 he named the Kindergarten or ‘child’s garden’. The … aim of these plays [games] … is to exercise and develop the child’s power of independent movement. They are journeys of discovery. They are plays which enrich the child with perceptions and experiences. We have never yet asked this question that several children have not at the same time stepped forth and called out, ‘I,’ ‘I’, ‘I’. ‘I, too, would like to walk’, etc. As the walking child holds out the right hand, each child in the circle responds by extending the right hand toward him. ‘And wish us a good day, good day’, etc. The children play this game very willingly. When one child has ended his walking, several more always step forward who wish to ‘walk’ in the same way. It is of course, understood that the leader must see that all the children have walked at the close of the play. As an answer to this, the child must mention the names of the children standing in the circle. This brings about a double exercise: it teaches him not to pass by objects without observing them, and also helps him to form a definite conception of the name of the object and its qualities, or at least its general impression.